The clone number has been updated from (2Q178) to (Rat 401) both clone numbers name the same antibody clone. Full length native protein (purified) corresponding to Rat Nestin. WB: Mouse brain and rat brain whole tissue lysates. IHC-P: Rat Brain 6 weeks (cerebellum sagittal, coronal rest) tissue sections. ICC/IF: Mouse embryonic stem cells. Our Abpromise guarantee covers the use of ab6142 in the following tested applications. ICC/IF 1/20 - 1/200. Cells fixed with 4% paraformaldehyde buffered with 50mM sodium borate at pH 9.5. Tissue fixed with 4% paraformaldehyde at pH 7.4 for light microscopy. IHC-Fr Use a concentration of 0.1 - 1 µg/ml. Tissue fixed with 4% paraformaldehyde at pH 7.4 for light microscopy. WB Use a concentration of 1 µg/ml. Predicted molecular weight: 200 kDa. Block with milk or BSA but do not dilute primary antibody in buffer containing milk. Required for brain and eye development. Promotes the disassembly of phosphorylated vimentin intermediate filaments (IF) during mitosis and may play a role in the trafficking and distribution of IF proteins and other cellular factors to daughter cells during progenitor cell division. Required for survival, renewal and mitogen-stimulated proliferation of neural progenitor cells. 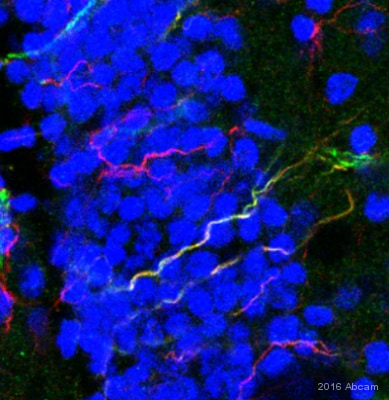 Upon terminal neural differentiation, nestin is down-regulated and replaced by neurofilaments. Constitutively phosphorylated. This increases during mitosis when the cytoplasmic intermediate filament network is reorganized. This blot was produced using a 3-8% Tris-Acetate gel under the Tris-Acetate buffer system. The gel was run at 150V for 60 minutes before being transferred onto a Nitrocellulose membrane at 30V for 70 minutes. The membrane was then blocked for an hour using 3% milk before being incubated with ab6142 overnight at 4°C. Antibody binding was detected using Goat anti-Rabbit IgG H&L (IRDye® 800CW) preadsorbed (ab216773) at 1/20000 dilution for 1 hour at room temperature before imaging. 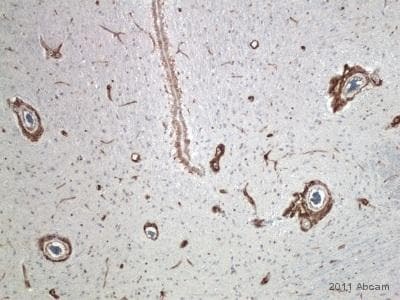 IHC image of Nestin staining in a section of formalin-fixed paraffin-embedded normal rat brain performed on a Leica BONDTM system using the standard protocol F. The section was pre-treated using heat mediated antigen retrieval with sodium citrate buffer (pH6, epitope retrieval solution 1) for 20mins. The section was then incubated with ab6142, 0.05ug/ml, for 15 mins at room temperature and detected using an HRP conjugated compact polymer system. DAB was used as the chromogen. The section was then counterstained with haematoxylin and mounted with DPX. Immunocytochemistry/ Immunofluorescence - Anti-Nestin antibody [Rat 401] (ab6142)Deng X et al. Co-transplantation of GDNF-overexpressing neural stem cells and fetal dopaminergic neurons mitigates motor symptoms in a rat model of Parkinson's disease. PLoS One 8:e80880 (2013). Mesencephalic neural stem cells were washed three times in PBS, fixed in 4% paraformaldehyde for 10 min at room temperature (RT), and permeabilized with PBS plus 0.25% Triton X-100 (PBST) for 10 min at RT (or 15 min at RT if the target antigen was a nucleoprotein). After three washes in PBS, the cells were blocked with 1% BSA for 30 min at RT and incubated with ab6142 staining Nestin (Red) at 1/1000 dilution. Immunolabeling was visualized by incubation (1 h at RT) with rhodamine-conjugated Affinipure goat anti-mouse or anti-rabbit IgG (1∶100). After three washes in PBS and two in deionized water, immunolabeled cells were counterstained with 50 µl DAPI at 37°C for 10 min and washed in sequence with methanol and ethanol. Cells were observed under a fluorescence microscope. 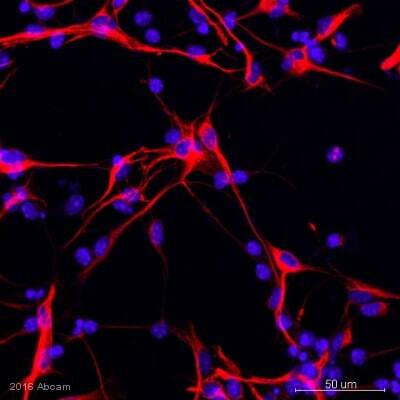 Fluorescence photomicrographs show that all neurospheres were immunoreactive for the NSCs marker nestin. The neurospheres of peGFPN1-GDNF-transfected mNSCs (termed GDNF-mNSCs) were strong immunopositive for GDNF compare to mNSCs transfected with peGFPN1. Green: FITC, Red: Nestin. Scale bar = 50 µm. Immunohistochemistry (Frozen sections) - Anti-Nestin antibody [Rat 401] (ab6142)This image is courtesy of an anonymous abreview. ab6142 at 1/500 dilution staining Nestin in rat brain tissue (green) by immunohistochemistry (frozen sections). Sections were methanol fixed, permeabilized in 0.1% Triton X-100 prior to blocking in 2.5% BSA for 16 hours at 4°C and then incubated with ab6142, for 1 hour at 37°C. Alexa fluor® 680 goat polyclonal to mouse Ig, diluted 1/1000 was used as the secondary antibody. Immunocytochemistry/ Immunofluorescence - Anti-Nestin antibody [Rat 401] (ab6142)This image is courtesy of an anonymous abreview. ab6142 staining mouse embryonic stem cells by immunocytochemistry/ immunofluorescence. Cells were PFA fixed and permeabilized in 0.4% Triton X-100 prior to blocking in 5% serum for 1 hour at 25°C. The primary antibody was diluted 1/500 and incubated with the sample for 20 hours at 4°C. 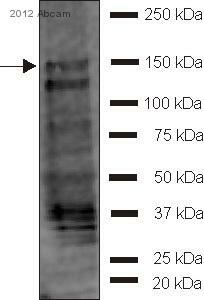 Alexa fluor® 568 goat polyclonal to mouse Ig, diluted 1/400, was used as the secondary antibody. 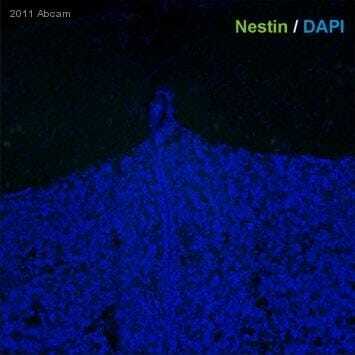 ab6142 staining Nestin in mouse brain tissue sections by ICC/IF (Immunocytochemistry/immunofluorescence). Cells were fixed with acetone, permeabilized with Triton X-100 in PBS and blocked with 5% BSA for 60 minutes at room temperature. Samples were incubated with primary antibody (1/1000 in PBST) for 12 hours at 4°C. An Alexa Fluor® 488-conjugated goat anti-mouse IgG monoclonal was used as the secondary antibody at a dilution of 1/200. ab6142 at 1/200 dilution staining Nestin in mouse Cor1 neural stem cells by Immunocytochemistry/ Immunofluorescence. Cells were fixed using 4%PFA for 15mins at RT. After x3 PBS rinses over 15mins, cells were blocked/permeabilised using primary Antibody dilution buffer for 15mins befpre application of primary Ab diluted in same buffer. Secondary conjugate was diluted in same buffer, with addition of 1/10K Hoechst, to stain nuclei. After 60mins cells were rinsed x3 over 15mins before coverslipping using Mowiol containing DABCO and azide. 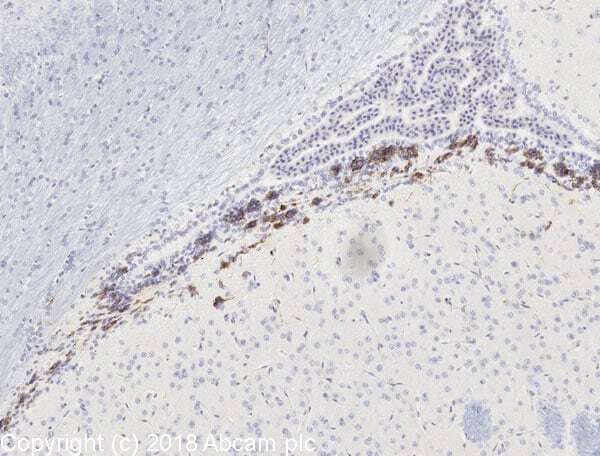 Immunohistochemistry (Formalin/PFA-fixed paraffin-embedded sections) - Anti-Nestin antibody [Rat 401] (ab6142)This image is courtesy of an anonymous abreview. ab6142 staining adult mouse brain tissue section by Immunohistochemistry (Formalin/PFA-fixed, paraffin embedded sections). Tissue underwent fixation in paraformaldehyde, heat mediated antigen retrieval in Sodium Citrate, permeabilization in 1% Triton buffer and blocking in 10% serum for 1 hour at 25°C. The primary antibody, diluted 1/200 (PBS, 2% Donkey serum, 0.2% Triton) for 16 hours at 4°C. An Alexa Fluor® 488 conjugated donkey polyclonal to mouse Ig, diluted 1/500 was used as the secondary. Publishing research using ab6142? Please let us know so that we can cite the reference in this datasheet. Cell harvesting/tissue preparation method: 4% PFA was used to fixed the cells for 30 mins at room temperature.